earth moving companies and many other industry professionals. The capacity of the 6 conference rooms will be enlarged in order to accommodate a growing number of participants to the different workshops, association meetings and Dealer Meetings promoted by carmakers with the objective to meet and discuss with the network. active in different sectors of the automotive distribution industry including DMS systems, warranty, insurance, financing, post-sales equipment and pre-owned sales management tools. The majority of the companies who took part in the 2011 edition already confirmed their presence for this year. They will be joined by some new entries, thus offering increasing business opportunities for all participants. 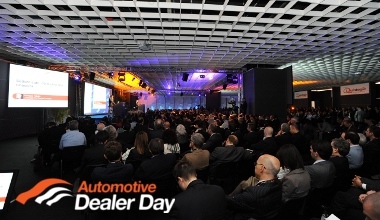 In addition, the 2012 edition will again feature the participation of several carmakers with an institutional presence at the event and a physical presence at the Business Area to meet their network. now customary Automotive Dealer Night: reserved exclusively to the Automotive Dealer Day participants, the event will be an evening of socialization and entertainment organized with the contribution of some sponsors. calendar on May 15-16-17 2012.